Rocking the System is subtitled Fearless and Amazing Irish Women who Made History and, really, it delivers exactly what the cover promises. The volume contains twenty illustrated essays on Irish women, from historical figures, beginning with Queen Maeve of Connacht, to contemporary achievers, with the final essay being about Sonia O'Sullivan, one of Ireland's most successful female athletes. In between the essays cover a range of significant and inspirational Irish women including activists, rebels, stateswomen, artists, writers, sportswomen and medical experts. The title references Mary Robinson's famous speech on her election as first female President of Ireland. 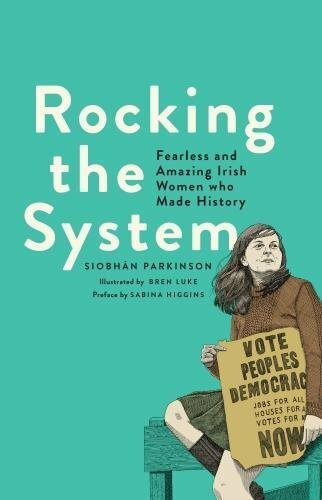 This book is written by Siobhan Parkinson, the first Irish Children's Laureate, aided by a research team of "fellow rockers", and has been published to celebrate the centenary of women's suffrage. Its target audience is young readers and its aim is to raise awareness of the remarkable achievements of Irish women and the extent to which their lives and opportunities have changed over the years and can continue to change in the future. Each essay features a detailed pen and ink portrait of its subject drawn by Australian illustrator Bren Luke. The information is very accessible as each essay is short with an initial summary and dates, relevant quotes in boxes and a fact file at the end. The end result is an empowering and fascinating collection with an intriguing array of subjects. Although its main readership will inevitably be young people in Ireland this timely volume contains much to intrigue, inspire and enlighten any reader.